bonafide persons of Gurkha category of Nepal and India. Last date for submission of application form to OSAP 2nd Battalion Jharuguda Odisha is 31-07-2017. The recruitment test will be held in OSAP 2nd Battalion Jharsuguda Parage Ground for this Grukha Sepoy is on 29-08-2017. Candidates must have registered their name in any one of Employment Exchange. Selection for this Gurkha Sepoy jobs of OSAP will be held based on Physical Tests and Interview. 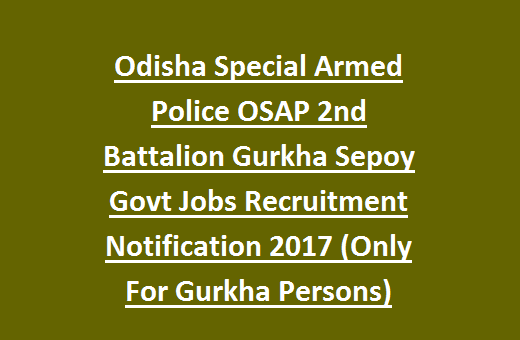 More details about Odisha Police Department OSAP 2nd Battalion Gurkha Sepoy Jobs recruitment information is given below. There are total 92 Gurkha Sepoy vacancies in OSAP2nd Battalion. As on 01-01-2017 candidates age limits are in between 18-25 years and for Ex Serviceman age relaxations are applicable as per the ESM Norms. Minimum qualification is 8th pass. But preference will be given to H.S.C passed candidates. Selection for this OSAP Gurkha Sepoy jobs will be based on Physical Tests and Interview. 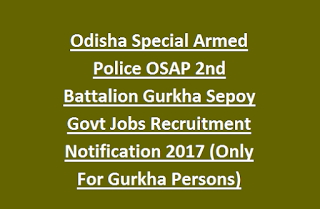 Interested candidates can submit their application form in a prescribed format to Assistant Commandant, OSAP 2nd Battalion, Jharsuguda, Pin-768204, Odisha for this Gurkha Sepoy Jobs on or before 31-07-2017 along with all required documents. For Nepal Candidates required documents refer official notification.